The E.coli|360-HCP ELISA is designed to cover a broader spectrum of E.coli host cell proteins (HCPs) than traditional generic HCP assays. The enhanced generic E.coli|360-HCP ELISA provides four kit types, each using a different antigen preparation so you can try several antibodies to find the one that works best for your samples. Figure 1: Standard curves for all four E.coli|360-HCP ELISAs were obtained by non-linear regression of measured OD values (A450) for different E.coli HCP standard concentrations. E.coli|360-HCP assay was widely tested on the basis of a great number of mock E.coli HCP samples. In case of sample 1 a recovery of 80% was estimated using assay type B. For sample 2 and 3 the best recovery rate was determined using kit type A. For sample 5 a sufficient recovery was only determined using kit type D, recovery rates determined with the other three kit types were below 30%. 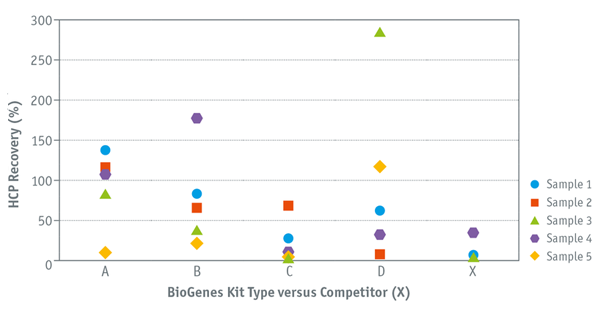 The competitor kit showed recoveries below 30% for all samples. 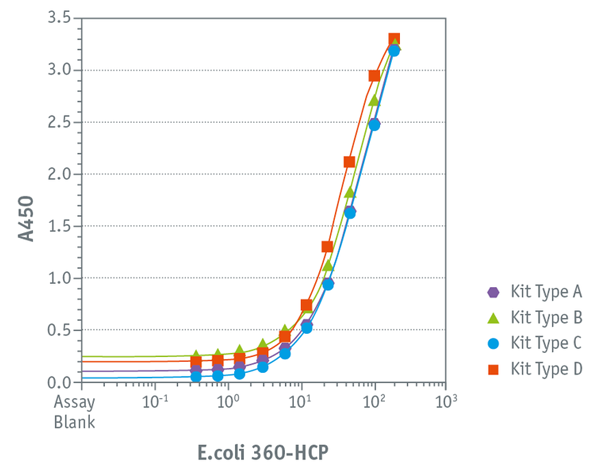 Figure 2: Selected mock E.coli HCP samples were tested using five different E.coli HCP assays – E.coli|360-HCP ELISA kit types (A to D) and a commercially available generic E.coli HCP assay. Recoveries higher than 100% are based on overestimation.